Background: Stevioside is a natural herbal sweetener extracted from Stevia rebaudiana. An in vitro study has proved the antibacterial efficacy of 0.2% Stevia aqueous solution against Streptococcus mutans and Lactobacillus acidophilus, and the present study was conducted to clinically evaluate the efficacy of Stevia leaf extract and Stevia product on plaque pH, when compared with sucrose solution. Materials and Methods: A clinical trial was conducted among a sample of 22 undergraduate students who volunteered. After obtaining consent, students were instructed not to brush at night and not to use any mouth rinse during the course of the study. Baseline plaque pH was measured in situ using digital pH meter. Students were asked to rinse for 1 min with 0.2% aqueous solution of Stevia leaf extract and plaque pH was measured in situ at 4 time points (5, 10, 15, and 30 min) after each rinse. After a washout period of 2 days, 10% sucrose and 1% Stevia product solutions were similarly tested. Statistical analysis was performed using analysis of variance (ANOVA) test and repeated measures ANOVA. Tukey's HSD test was used to obtain multiple comparisons. The level of significance was set to be at P < 0.05. Results: At 5, 10, 15, and 30 min, a significant difference in mean plaque pH values was observed between three test solutions (P < 0.000). Post hoc Tukey's HSD test showed that the difference in mean pH values between aqueous Stevia extract and sucrose and Stevia product and sucrose was highly significant (P < 0.000). Conclusion: Stevia leaf extract and commercially available Stevia product did not significantly affect plaque pH values, implying that two solutions are non-fermentable and do not support bacterial survival. Dental caries is the most prevalent, ubiquitous infectious disease affecting all the age groups. Fermentable dietary sugar has been implicated as a crucial factor in dental caries and sucrose is an important factor that contributes to the formation and development of the bacterial plaque. Stephan in his classic studies in the early 1940s showed that dental plaque exposed to sucrose could rapidly produce acids, causing a rapid drop in pH followed by a gradual recovery toward the baseline plaque pH. Dental caries despite being preventable continues to be a public health concern in developing countries like India. With support from the evidence, replacement of sucrose with non-fermentable sugar substitute has become an important strategy in caries prevention., Most of the non-fermentable sweeteners has its own inherent side effects. Long-term consumption of these artificial sweeteners can cause adverse effects in humans, thereby raising health concerns. The antibacterial activity of different extracts of S. rebaudiana leaves against bacteria that are important in dental caries and oral health has been proved in in vitro studies. Das et al., 1992 in an in vitro study proved the noncariogenic potential of stevioside. Mohammadi-Sichani et al., Debnath et al., Gamboa and Chaves, and Ajagannanavar et al. demonstrated the antimicrobial activity of Stevia in various solvents against Streptococcus mutans and Lactobacillus acidophilus.,,, The noncariogenic potential of Stevia extracts – stevioside and rebaudioside in vivo – was proved in a study conducted by Brambilla et al. in 2013. The antiplaque and antigingivitis properties of Stevia have been reported by Vandana et al. However, no studies on the effect of aqueous solution of Stevia leaf extract and commercially available Stevia product on plaque pH are available. The antibacterial efficacy of 0.2% aqueous solution of Stevia leaf extract against S. mutans and L. acidophilus was studied in vitro in the Department of Public Health Dentistry, FDS, MSRUAS. However, the antibacterial efficacy of commercially available Stevia product could not be assessed, and hence, we decided to further explore it clinically. The objective of this study was to evaluate clinically the effect of Stevia leaf extract and Stevia product on plaque pH when compared with sucrose solution. This was an interventional study with 22 participants carrying out mouth rinsing with different solutions such as 0.2% aqueous Stevia, 10% sucrose, and 1% Stevia product. Study participants were the student volunteers of Bachelor of Dentistry, aged between 18 and 25 years. The study proposal was drafted and the ethical clearance was obtained from the Institutional Ethics Committee and registered at http://www.ctri.nic.in (CTRI/2017/10/010154). Based on the previous study, the observed mean difference was calculated to be 0.5. Assuming the superiority margin of 0.4 with an effect size of 0.53, power 80%, and alpha error 5%, a sample size of 22 was calculated using nMaster sample size software version 2.0. (Department of Biostatistics, Christian Medical College, Vellore, India). Potential participants for this study were identified from undergraduate students and a complete dental examination was performed. The inclusion criteria were students aged between 18 and 25 years and decayed, missing, and filled teeth (DMFT) score ≥1. Students were excluded if they were undergoing orthodontic treatment or with a history of taking antibiotics within 4 weeks and during the study period. The antibacterial efficacy of 0.2% aqueous solution of Stevia leaf extract against S. mutans and L. acidophilus was studied in vitro in the Department of Public Health Dentistry, FDS, MSRUAS. In disc diffusion method, minimal inhibitory concentration (MIC) of aqueous Stevia extract against S. mutans was determined at 2 mg/ml concentration. Based on this finding, the following rinsing solutions were prepared as follows. Rinse 1: Aqueous Stevia solution was prepared by dissolving 0.2 g of the dried Stevia leaf powder in 100 ml of distilled water and brought to boil at 50°C for 2 min and filtered (0.2% aqueous Stevia solution). Rinse 2: Sucrose test solution – considering the sweetness equivalence, it was prepared by dissolving 10 g of sucrose in 100 ml of distilled water (10% sucrose solution). Rinse 3: Stevia product solution was made from Cerovia manufactured by Stevia world. Cerovia powder is 10 times sweeter than sucrose. Adjusting the sweetness equivalence, the solution was prepared by dissolving 1 g of Cerovia powder in 100 ml of distilled water (1% Stevia product solution). This interventional study was conducted over a period of 2 months. Having given informed consent, 22 volunteers fulfilling the inclusion criteria were recruited for the study. The purpose of the study was explained to the recruited study participants. They were instructed not to brush at night and not to use any mouth rinse during the course of the study. A structured proforma was designed to record information on demographic characteristics, oral hygiene practices, and sugar intake. Clinical examination was carried out using autoclaved instruments. DMFT index and Silness and Loe plaque index (1964) were recorded at the baseline. The students were instructed not to drink or eat for at least 2 hrs before pH measurements. Baseline plaque pH was measured by a microelectrode attached to a digital pH meter (LUTRON PH-206). pH microelectrode was inserted at interproximal site between first molar and second premolar in first and second quadrant (16, 26). In case of the presence of any restoration, measurements were done in the first and second premolars interproximal area of the same quadrant. The pH value was recorded by placing the tip of the electrode into the plaque mass and held in place until the reading on the display unit had stabilized and the data were recorded. Initially, the tip of new pH electrode was soaked in KCl solution for several hours before use. Once prepared, the electrode was stored in a reference buffer (pH = 7). Immediately before and after each series of readings at each time point, the electrode was calibrated against standard pH buffers at pH 4 and 7 values. Between each reading, the electrode was cleaned in distilled water and dried on absorbent paper to protect against cross-contamination. For each subject, baseline plaque pH was recorded and followed by 5, 10, 15, and 30 min interval after 1 min rinsing of 10 ml of the test solutions. After measuring the baseline plaque pH, all the students were given 10 ml of 0.2% aqueous Stevia solution. They were asked to rinse for 1 min. Quantity of rinses was measured using a measuring cup and the time was noted using a stopwatch. Plaque pH was measured at 5, 10, 15, and 30 min after the mouth rinse using the digital pH meter. One examiner performed all pH measurements who was blinded with respect to the rinse used by the students. A washout period of 2 days was given to avoid the carryover effect of the mouth rinse before the next mouth rinse is assigned. After the washout period, the second solution and third solutions were similarly tested [Figure 1]. Figure 1: Schematic representation of study design. Data were analyzed using SPSS version 16.0. (IBM Corporation, Chicago, IL, USA). For comparison of mean pH values of different times within aqueous Stevia extract, sucrose, and Stevia product groups, repeated measures analysis of variance (ANOVA) test was used. 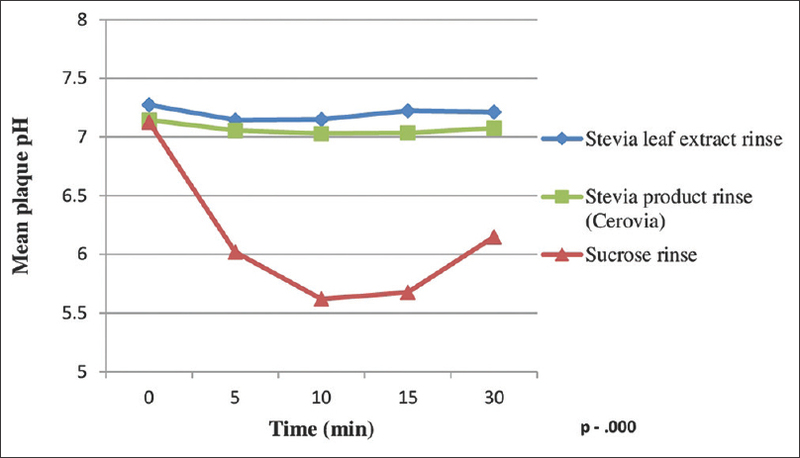 ANOVA test was used to compare the mean pH values between aqueous Stevia extract, sucrose rinses, and Stevia product. This was followed by post hoc Tukey's HSD test to obtain multiple comparisons. The level of significance was set to be at P < 0.05. Twenty-two volunteers took part in the study, 14 of which were female and eight were male. Mean DMFT and plaque index score were 2.09 and 0.507, respectively. Repeated measures ANOVA showed a significant difference in the mean pH values of aqueous Stevia extract at 5 (P = 0.003) and 10 (P = 0.024) min when compared with baseline, whereas mean plaque pH of sucrose solution showed statistically significant difference at 5, 10, 15, and 30 min compared to baseline pH (P < 0.000). No statistically significant difference in pH was observed at 5, 10, 15, and 30 min with Stevia product when compared to baseline pH (P > 0.05). ANOVA was used to compare the mean plaque pH values between aqueous Stevia extract, sucrose rinses, and Stevia product. At the baseline, there was no statistically significant difference in mean plaque pH values between the three test solutions (P = 0.314), whereas at 5, 10, 15, and 30 min, statistically significant difference in mean plaque pH values was observed between three test solutions (P < 0.000) [Table 1]. Post hoc Tukey's HSD test [Table 2] showed that the difference in mean pH values between aqueous Stevia extract and Stevia product was not statistically significant (P > 0.05). However, the difference between aqueous Stevia extract and sucrose and Stevia product and sucrose was highly significant (P < 0.000). [Figure 2] illustrates the reduction in mean plaque pH at 5, 10, 15, and 30 min interval after rinsing of three test solutions. Following sucrose rinse, the plaque pH decreased up to 5.7 nearing the critical pH value (5.5) after 5 min, whereas the plaque pH remained almost the same after rinsing with Stevia leaf extract and Stevia product solutions. Figure 2: Mean plaque pH versus time curves for all test solutions. The present study was conducted to evaluate the clinical efficacy of 0.2% aqueous solution of Stevia leaf extract and commercially available Stevia product on plaque pH, in comparison with sucrose solution. The findings showed that there was a reduction in the mean plaque pH following rinsing with 10% sucrose solution whereas the plaque pH remained almost the same after rinsing with Stevia leaf extract and Stevia product solutions. There was no statistical difference in the pH values among the students at baseline. The change in plaque pH values after rinsing with Stevia leaf extract and Stevia product solution is consistent with the findings of Brambilla et al., who investigated the effect of the two main Stevia extracts, stevioside, and rebaudioside A on plaque pH and reported that the two compounds do not support acidogenic metabolism from supragingival plaque bacteria. The probable mechanism of action could be due to an inhibitory effect of the two Stevia extracts on bacterial fermentative metabolism. In vitro part of this study confirmed the cariostatic potential of the Stevia extracts by the suppression of bacterial growth. In the present study, 0.2% concentration of aqueous Stevia extract was prepared. This was based on the findings of an in vitro study conducted in our department. In disc diffusion method, MIC of aqueous Stevia extract against S. mutans and L. acidophilus was determined at 2 mg/ml concentration. The antibacterial efficacy of Stevia product could not be proved in the in vitro study, and we decided to further explore it clinically. Considering the sweetness equivalence, sucrose and Stevia product solutions were prepared. Various methods have been used by different investigators to determine the pH of dental plaque of which each method has its strength and weakness., In our study, the method used for this purpose was single-glass electrode fitted to a digital pH meter (LUTRON PH-206) which allows direct reading of interdental plaque pH. The trial was a single-blinded trial as the examiner who measured the plaque pH was blinded with respect to the rinse used by the students. On the basis of in vitro experiments and theoretical considerations, critical pH has been reported to be in the range of 5.0–6.0, most probably 5.5. In this study, no plaque pH drop below 5.5 (critical pH) was recorded following sucrose rinse group due to methodological issues. All the participants in the study were dental students and seem to have better oral hygiene practices. Various researches have proved that mature plaque (2–3 days old) give a greater level of acid production than immature plaque. Moreover, the pH fall itself depends upon various factors such as acidogenicity of the plaque microflora, nature of the acids formed, formation of neutralizing metabolic products, buffering capacity of the plaque, concentration of substrate surrounding the bacteria, and duration of the supply of the substrate, diffusion of substrate and metabolic products in plaque, influence of the saliva environment of these parameters. In this study, mean plaque pH of aqueous Stevia extract showed significant difference at 5 and 10 min when compared with baseline. The plaque pH remained alkaline throughout different time intervals for both Stevia leaf extract and Stevia product solution. Although the antibacterial efficacy of commercially available Stevia product could not be proved in the in vitro study, clinically, it behaved in a similar way to aqueous Stevia extract solution. Most commercial processes consist of water extraction, decoloration, and purification using ion exchange resins, electrolytic techniques, or precipitating agents. The possible reason for this activity needs to be explored. Due to the nonavailability of the evidence, the results of commercially available Stevia product in altering plaque pH could not be compared. In 2017, Usha et al. proved that 0.5% S. rebaudiana extract improved the pH and buffering capacity of the saliva in a high caries risk patient. Abdul Razak et al. had reported that alternative sweeteners such as equal Stevia were equally effective as xylitol in reducing the presence of extracellular matrix in streptococci biofilms. This study mainly concerns with its influence on change of pH within plaque, and therefore, further researches on microbiological analysis of stevioside on cariogenic species are needed for confirmation. Clinically, both Stevia leaf extract and Stevia product solutions behave in a similar way as the plaque pH remained alkaline. Stevia leaf extract and commercially available Stevia product did not significantly affect plaque pH values implying that two solutions are nonfermentable and do not support bacterial survival. It appears to be a promising herbal sweetener to be used as an alternative in oral preparations and confectionaries. We acknowledge Skanda Lifesciences private limited for providing us the facilities, Stevia World Agrotech Pvt. Ltd, Bengaluru for providing with the plant material. We also thank our Dean and management of Faculty of Dental Sciences, MSRUAS, Bengaluru, India for their support in completing the research. Kleinberg I. The other side of confection use and dental caries. J Can Dent Assoc 1989;55:837-8. Walsh LJ. Dental plaque fermentation and its role in caries risk assessment. Int Dent SA Australas 2006;1:4-13. Kalra S, Simratvir M, Kalra R, Janjua K, Singh G. Change in dental caries status over 2 years in children of Panchkula, Haryana: A longitudinal study. J Int Soc Prev Community Dent 2011;1:57-9. Burt BA. Relative consumption of sucrose and other sugars: Has it been a factor in reduced caries experience? Caries Res 1993;27 Suppl 1:56-63. Loesche WJ. The rationale for caries prevention through the use of sugar substitutes. Int Dent J 1985;35:1-8. Fowler SP, Williams K, Resendez RG, Hunt KJ, Hazuda HP, Stern MP. Fueling the obesity epidemic? Artificially sweetened beverage use and long-term weight gain. Obesity (Silver Spring) 2008;16:1894-900. Geuns JM. Stevioside. Phytochemistry 2003;64:913-21. Kinghorn A. Overview-Stevia, the Genus Stevia. Medicinal and Aromatic Plants: Industrial Profiles. Vol. 19. London and NY: Taylor and Francis; 2002. p. 1-17. Goyal SK, Samsher, Goyal RK. Stevia (Stevia rebaudiana) a bio-sweetener: A review. Int J Food Sci Nutr 2010;61:1-10. Ashwell M. Stevia, nature's zero-calorie sustainable sweetener: A new player in the fight against obesity. Nutr Today 2015;50:129-34. Debnath M. Clonal propagation and antimicrobial activity of an endemic medicinal plant Stevia rebaudiana. J Med Plants Res 2008;2:245-51. Ahmed B, Hossain M, Islam R, Saha AK, Mandal A. A review on natural sweetener plant-stevia having medicinal and commercial importance. Agronomski Glas 2011;73:75-91. Arora E, Khajuria V, Kumar S, Gillani Z, Sadiq S, Tandon VR, et al. Stevia: A promising herbal sweeteners. JK Sci 2010;12:212-3. Amin K, Ozgen S, Selamoglu Z. Stevia rebaudiana: A potential boon for human health. SM J Med Plants Stud 2017;1:1005. Das S, Das AK, Murphy RA, Punwani IC, Nasution MP, Kinghorn AD, et al. Evaluation of the cariogenic potential of the intense natural sweeteners stevioside and rebaudioside A. Caries Res 1992;26:363-6. Mohammadi-Sichani M, Karbasizadeh V, Aghai F, Mofid MR. Effect of different extracts of Stevia rebaudiana leaves on Streptococcus mutans growth. J Med Plants Res 2012;6:4731-4. Gamboa F, Chaves M. Antimicrobial potential of extracts from Stevia rebaudiana leaves against bacteria of importance in dental caries. Acta Odontol Latinoam 2012;25:171-5. Ajagannanavar SL, Shamarao S, Battur H, Tikare S, Al-Kheraif AA, Al Sayed MS, et al. Effect of aqueous and alcoholic stevia (Stevia rebaudiana) extracts against Streptococcus mutans and Lactobacillus acidophilus in comparison to chlorhexidine: An in vitro study. J Int Soc Prev Community Dent 2014;4:S116-21. Brambilla E, Cagetti MG, Ionescu A, Campus G, Lingström P. An in vitro and in vivo comparison of the effect of Stevia rebaudiana extracts on different caries-related variables: A randomized controlled trial pilot study. Caries Res 2014;48:19-23. Vandana K, Reddy VC, Sudhir KM, Kumar K, Raju SH, Babu JN, et al. Effectiveness of stevia as a mouthrinse among 12-15-year-old schoolchildren in Nellore district, Andhra Pradesh – A randomized controlled trial. J Indian Soc Periodontol 2017;21:37-43. Savita SM, Sheela K, Sunanda S, Shankar A, Ramakrishna P. Stevia rebaudiana – A Functional component for food industry. J Hum Ecol 2004;15:261-4. Roos EH, Donly KJ.In vivo dental plaque pH variation with regular and diet soft drinks. Pediatr Dent 2002;24:350-3. Schachtele CF, Jensen ME. Comparison of methods for monitoring changes in the pH of human dental plaque. J Dent Res 1982;61:1117-25. Lingström P, Imfeld T, Birkhed D. Comparison of three different methods for measurement of plaque-pH in humans after consumption of soft bread and potato chips. J Dent Res 1993;72:865-70. Sharma A, Deshpande S. Effect of sucrose in different commonly used pediatric medicines upon plaque pH in human subjects. J Indian Soc Pedod Prev Dent 2011;29:144-8. Usha C, Ramarao S, John BM, Babu ME. Anticariogenicity of Stevia rebaudiana extract when used as a mouthwash in high caries risk patients: Randomized controlled clinical trial. World J Dent 2017;8:364-9. Abdul Razak F, Baharuddin BA, Akbar EF, Norizan AH, Ibrahim NF, Musa MY. Alternative sweeteners influence the biomass of oral biofilm. Arch Oral Biol 2017;80:180-4.